The Foam Dart Wars have been a tradition at the West Coast Haunters Convention as a fun way for vendors and attendees to blow off steam after a long day of vending and haunting. This year, the Foam Dart Wars are a twice daily activity in a designated location on the tradeshow floor and at designated times each day. Please follow these guidelines to ensure the Foam Dart Wars are fun for you and those around you. 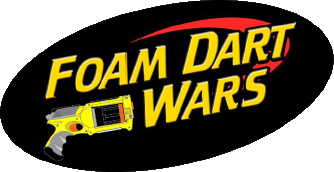 Foam Dart Wars will only take place in the Foam Dart War Zone (FDWZ) along the first vendor row. Foam Dart Wars will start at 10:30 AM and 4:30 PM on Friday, Saturday, and 12:30 PM on Sunday, and will last 5 minutes. Anyone found firing weapons outside of the designated Foam Dart Wars time will be asked to make a $5 penalty donation to the WCHC charity. This is an all ages event. Parents are responsible for the conduct of their children. Please respect the vendor booths in the FDWZ and avoid damaging the booths or merchandise. The West Coast Haunters Convention and the DoubleTree by Hilton will not be held responsible for any damage. Pick up your foam darts. Any remaining foam darts will be collected and resold at the FDWZ Info Booth. Anyone caught firing a foam dart weapon outside of the designated hours and outside the FDWZ will be encouraged to make a $1 donation to the WCHC charity.